Working with livestock can be a dangerous business. Every year over 15,000 Kiwis are injured in animal related accidents. Changes to NZ’s Health and Safety laws mean the farm owner can now become personally liable for accidents on the farm! One person is all you need to operate a Te Pari steel yard. Curved narrow pens encourage animals to move to the front of the yard and a circular forcing gate lets you reduce the size of the forcing pen as cattle enter, eliminating the need to climb into the pen. All Te Pari yards use New Zealand made oval tube called Cattlerail on all horizontal rails. This oval tube has the strength of a square tube however the large flat side makes it animal friendly and anti-bruise, helping keep your stock in top condition. Deflection testing has shown that Te Pari Cattle Rail is the strongest in its class. Generous 1 metre wide catwalks, 400 mm off ground level. This allows multiple operations to be carried out by multiple operators, at the same time, safely and effectively. Larger designs have stock free working zones for increased safety when working with larger mobs. Provides a safe area for machinery and equipment. Easy access to pens through well positioned man gates. Open race top design with no obstructions and a lower inside rail height makes working on stock easy and safe. Te Pari’s curved races and yard designs improve stock flow around the operator making them more efficient and less stressful for stock. We have a series of proven plans to choose from. The basic design principles underlying most good cattle yards are incorporated in Te Pari Stockyard designs. A large range of plans are available, from 5 head yards to 400 head systems – from lifestyle blocks to large stations. You can choose a plan directly from our range, adapt a yard to suit your needs or design your own yard. Our customer services team are there to help you design a yard to suit your operation and are available to do on-site consultations. The Te Pari range of Cattle crushes are built to have a long and hard life as a faithful workmate. They take a hammering so you don’t have to. Our Te Pari Cattle crushes are designed to get the job done without putting unnecessary stress on the operators or the animals. The benefit of purchasing Te Pari Cattle crushes is the design, build-quality and safety features. All our crushes are designed with the safety of the operator as our primary concern. These safety features will ensure the operator can focus on getting the job done without fear of injury. The Te Pari range of headbails is sturdy, safe, easy to operate and has a quiet action. Mostly, headbails are manually operated, however, pneumatic and hydraulic operations are available. In general terms there are two types of Headbails; Self-catching Headbails and Full Opening Manual Concertina Style Headbails. but no matter what type of Headbail you select, it is important that it is fitted and adjusted correctly. Te Pari Headbails are designed for safe and easy operation, with minimal maintenance. Our latest design is a perfect example of this – A stepped loading ramp that provides a sure footed tread for stock and operators. Having steps instead of a sloped surface drastically reduces slipping when the ramp is wet or mucky. Please note: The image also includes our Flat Top Landing with access door. The Te Pari Ultimate Gate has been designed to overcome the typical problems presented by average gates. The average gate needs a bottom brace to retain integrity but this is a trip hazard and prevents muck from being hosed out when cleaning the yards. The new patented Ultimate Gate has been designed to overcome the requirement for bracing across the bottom of the gateway by adding in an additional brace at the top. Over the last decade timber cattle yards have begun to be replaced by their steel counterparts, and there are many good reasons for the change. Some of the main benefits of steel: they are virtually maintenance free; quick to install so you can get straight back into the real work; stronger than timber and therefore safer; and the railings are anti-bruise keeping stock in top condition. You can download the latest edition of the our Top Yards Guide at here. Click here to request the complete installation guide. Our modular designs mean you can expand your yard to suit your changing needs. The entire yard can be moved to a different site if the need arises. Not only is this convenient but it can future proof your enterprise if you have a change of farming policy. A Te Pari Yard System is not money banged in the ground. The Steel Te Pari Yards can be easily relocated, changed or even sold at a later date should your needs change. This makes investing in Te Pari Steel Yards a smart move. The Te Pari System is virtually maintenance free. Say good bye to fixing up those broken wooded rails after each yarding! More time for the business of farming. 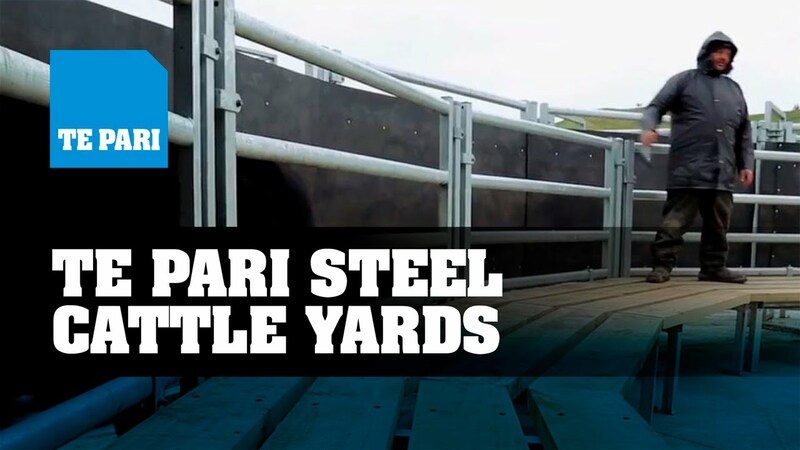 Te Pari Yards are manufactured using a specially design oval Anti-bruise steel tubing. No single pressure point and no sharp edges – meaning reduced bruising for your stock and more money for your beef. Our customers regularly testify to the ease and speed of working in Te Pari Yards. Being able to work your cattle quickly means your stock handling is more likely to ‘get done’ or ‘done more often’. Cattle have a natural tendency to circle their handler, so our circular designs allow cattle to flow much better. Research shows circular yards can be up to 30% more efficient than square or rectangular yards thus allowing a much higher throughput of cattle. At Te Pari, we believe that we offer the best value livestock equipment on the market. If you believe you have been offered the same specification deal at a cheaper price, we ask that you bring us the deal before you sign and we promise to show you that we offer better value. Value is our promise to you.